Journalist ◆ Filmmaker ◆ Academic | ABODE interviews two great conductors to find out what drives their passion for music. Published March 2012. Published in the March 2012 issue of ABODE magazine. Published by ABODE magazine. Gerald Wirth is the conductor and artistic director of the Vienna Boys’ Choir, one of Europe’s premiere children’s vocal ensembles. In January, the group travelled to Qatar to perform a New Year’s concert with the Qatar Philharmonic Orchestra and a special recital with the Al Jazeera Children’s Channel Choir. Wirth, himself a former child member of the choir, explains how the group transforms the lives of its young stars and expands audiences’ horizons. What was your favorite moment performing in Qatar? Do you think the Vienna Boys’ Choir has brought something to the Doha community? How has the choir changed since you were a young member? Well, the choir is more than 500 years old, so when I was boy and now is just a little portion of the choir’s history. The big things like the daily training, the singing, and the repertoire to some extent have been very similar since the time that I was a boy. Nowadays, which is probably because of my personal interest, we do more international music; we do more collaboration with international musicians of other cultures. What has the group brought to the Al Jazeera Children’s Channel Choir? What has the choir added to the boys’ lives? What is the Vienna Boys’ Choir planning next? What message do you hope to leave with the people of Qatar? 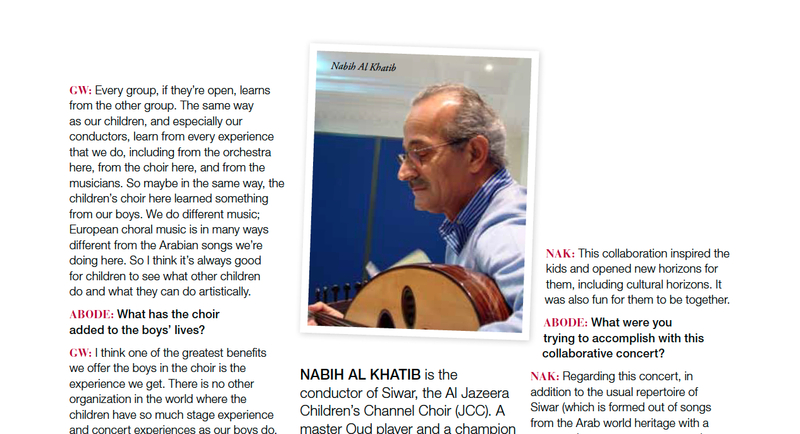 Nabih Al Khatib is the conductor of Siwar, the Al Jazeera Children’s Channel (JCC) Choir. A master Oud player and a champion of traditional Arabic music, this accomplished Lebanese composer and conductor is transforming Qatar’s musical landscape one child at a time. Siwar, which means bracelet in Arabic, is composed of Qatari and Arab children ages nine to 16. The choir was established by the JCC to help the country’s many talented youngsters discover and explore the rich musical heritage and diverse repertoire of the Arab world. In January, Siwar had the opportunity to perform with the Vienna Boys’ Choir. Al Khatib reflects on the experience. What is the significance of Siwar’s collaboration with the Vienna Boys’ Choir? How did it benefit Siwar’s young talent? What were you trying to accomplish with this collaborative concert? What other important lessons have you taught the children in Siwar? Before we started rehearsing every day, I explained to the children the importance of the music and how music can affect their lives, etc. So not only do we teach them how to sing, we explain everything about music. How do you hope the Doha community will react to future concerts?